Venerable Rathana Thera did not achieve anything by coming into Parliament but he would be able to achieve much for the country if he resigned as a Member of Parliament, State Minister of Skills Development Palitha Range Bandara said. He said monks should not come into Parliament as such a thing would not benefit the people and the clergy as well. Mr. Range Bandara, who was speaking during a ceremony held at the Ministry yesterday, said monks coming into Parliament was a hindrance to the development of the society. “There were eight monks who entered Parliament in 2004. They were well respected but they had lost that respect by the time they left the House,” the state Minister said. Well said he just became silent and looked the otherway with out any contribution..
rathna thera should resign form the parliament and take Rev Sobitha theras foot path. Absolutely correct. Ven Rathana could decide to give up robes and be in Parliament or advocate for what is right as a Buddhist priest from outside parliament. 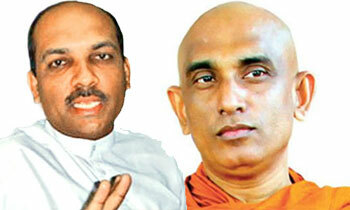 It is high time the Sangha council decided one or the other.. I respect the thera in and outside politics very much more than this good for nothing politico. I agree that clergy of any religion should not be in parliament or politics. However, I respect Rathana Thera for what he tries to achieve. Not an easy task amongst these crooked politicians. Somebody with a spine finally spoke the truth. Good job Minister Bandara.